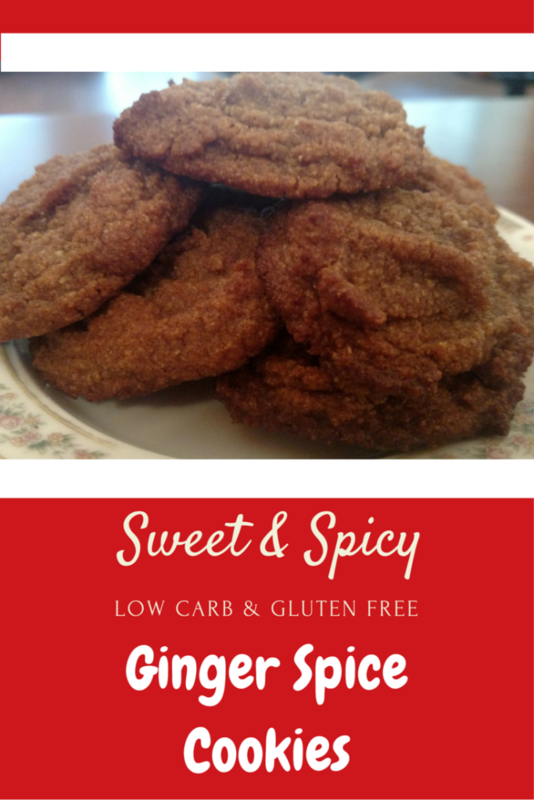 A Low Carb Gluten Free Spice Cookie for Christmas? Yes, Please! 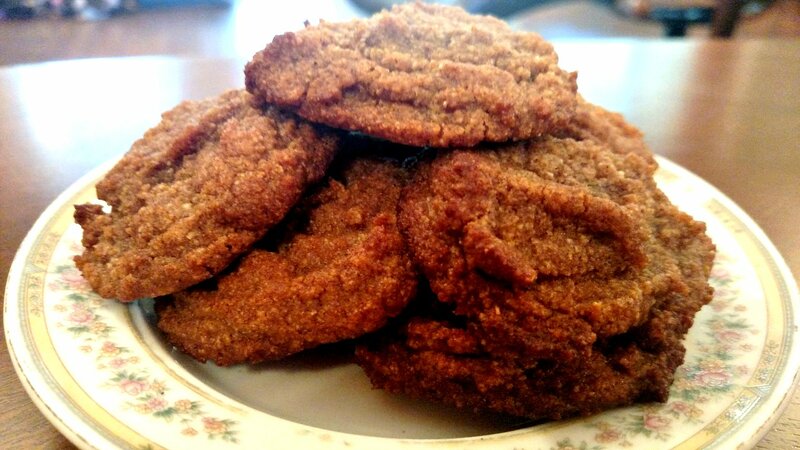 I’ve always had a thing about ginger spice cookies. The ginger flavor just reminds me of my Aunt Dorothy. Christmas at her house meant spice cakes and gingersnaps. Plus, ginger cookies are so darn homey and Christmas-y. My husband and son don’t like them, but I don’t care, more for me! So the past few Christmases or so that I’ve been gluten free and low carb, you can imagine how bummed I’ve been that I haven’t been able to eat my traditional ginger snaps. This year I decided it’s going to be different. I WILL eat ginger snaps for the Holidays! This is one recipe I had to fiddle with to get it to work out right. At first, I tried making them with a mixture of almond flour and protein powder. The taste was spot on, but I might as well have been eating sawdust. Ugh. I wasn’t really sure how to make it better, but then I got to thinking about the way I made my GF chocolate chip cookies. They had no eggs at all, and used liquid sweetener and oil to bind it together. I know gingersnaps are usually crunchy, but I was willing to overlook that as long as they tasted like gingersnaps. When I was looking on Pinterest for a low carb gluten free spice cookie, a traditional gingersnap recipe popped up on my feed. It used brown butter to give the cookies a real rich flavor. It sounded so good, I decided to try it instead of the coconut oil. OMG, browned butter makes these cookies taste AMAZING! 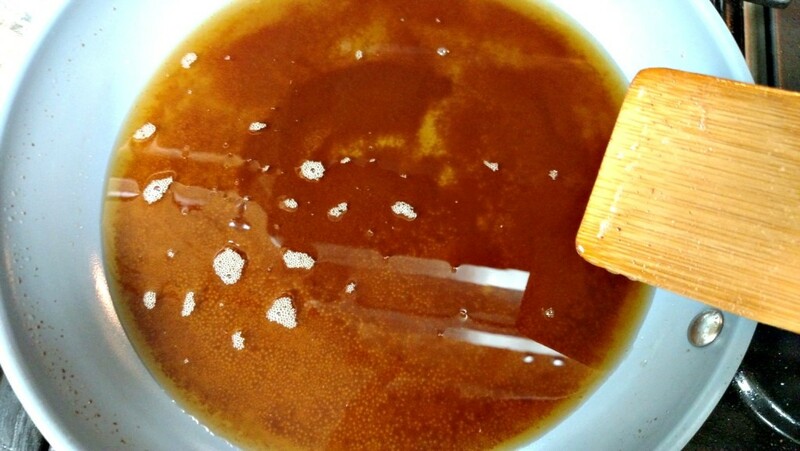 For the sweetener, I used xylitol maple syrup and Lakanto golden monk fruit. I’ve fallen in love with golden monk fruit, because I’ve found it’s a pretty close low carb substitute for brown sugar. And then, to give it a more authentic flavor, I decided to add a tablespoon of unsulphured molasses. Yeah, I know it’s not a low carb ingredient. But a tablespoon distributed throughout 20 cookies is not bad, and each cookie has a little less than two carbs a piece. The first step in the low carb ginger cookies recipe is browning the butter. Don’t know how to brown butter you say? I was kind of intimidated by this step, but it turns out it’s a whole lot easier than I thought. First off, you’ll have 100% more success if you use a light colored pan. Browned butter can turn to burnt butter quickly, and you can’t tell the difference unless you’ve got a dark bottomed pan. I personally recommend the Green Pan. It’s light, and nonstick. Love it! Melt one stick of unsalted butter, stirring constantly. It will foam a little, but that’s just the water in the butter cooking off. Continue stirring until it’s an amber color. Don’t worry about the brown bits at the bottom. That is just cooked milk solids. Some people don’t care for it and separate it before they add it to a recipe. I personally like the flavor, and it lends a darker color to the cookies. 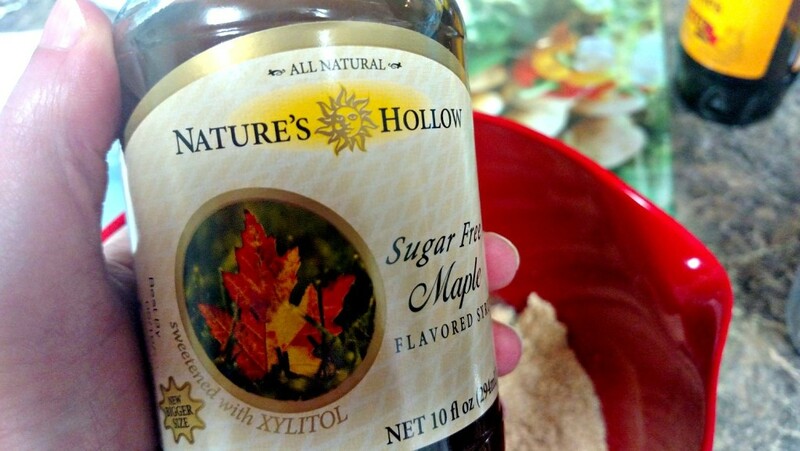 Now add your browned butter, 1 tbsp unsulphured molasses, and 1/4 cup xylitol maple syrup. I’ll give a bit of advice here. I’ve tried this with store brand sugar free syrup, and I got cookies with a funky rubbery texture. It might have been just the brands I tried, but I’ve only ever had success with xylitol maple syrup or honey. Mix everything together well, and drop by teaspoonfuls onto a parchment paper lined cookie sheet. Bake at 350 F for 15-20 minutes, or until firm. Let them sit and cool for a few minutes before you move them to a rack to finish cooling. This recipe will make approximately 20 cookies. 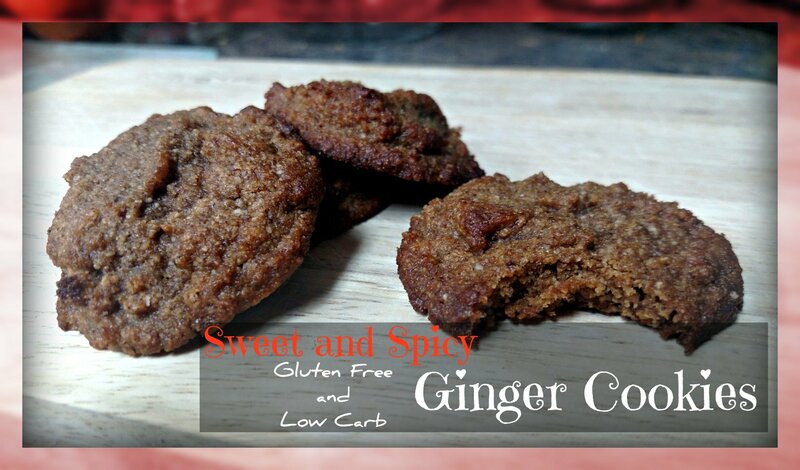 Even though they’re not crispy and crunchy like regular gingersnaps, this low carb ginger cookies recipe gives them the same zesty kick and taste. I hope you’ll give them a try for the Holidays, or anytime you get the ginger spice craving. 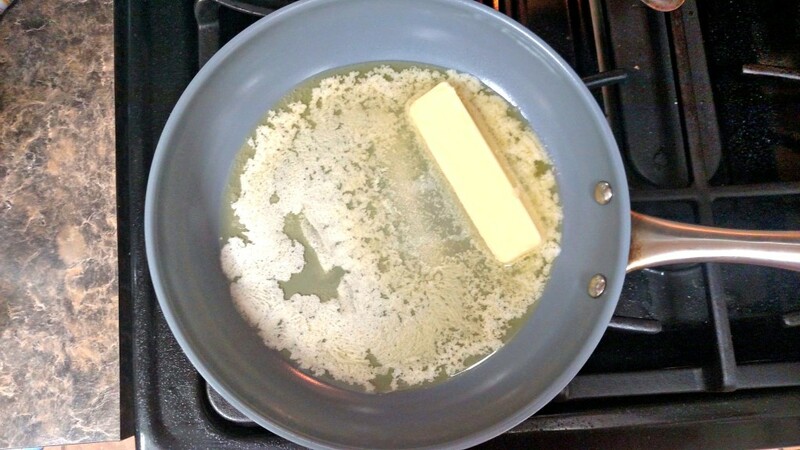 Melt one stick of butter in a light colored pan. Brown butter. Set aside to cool. 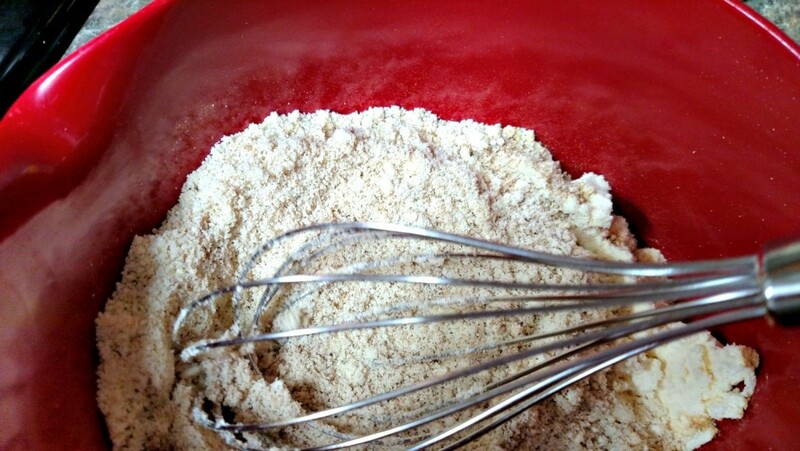 Add dry ingredients in a bowl and mix well. Add liquid ingredients, and incorporate fully. 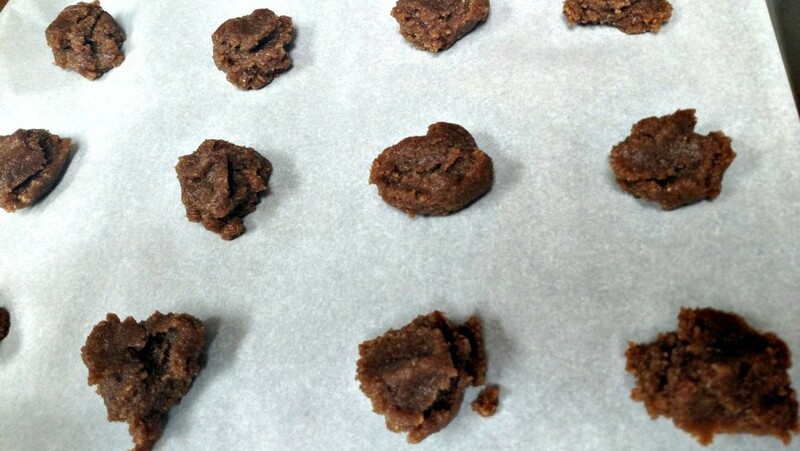 Drop by rounded teaspoonfuls on a parchment lined cookie sheet. Bake for 15-20 minutes, or until done. Let the cookies cool slightly on the cookie sheet, and then transfer to a cookie rack to finish cooling. One of the things I love best about gluten free and low carb cooking, is that you can take a basic recipe, use some imagination, and, viola, you have a yummy new treat. 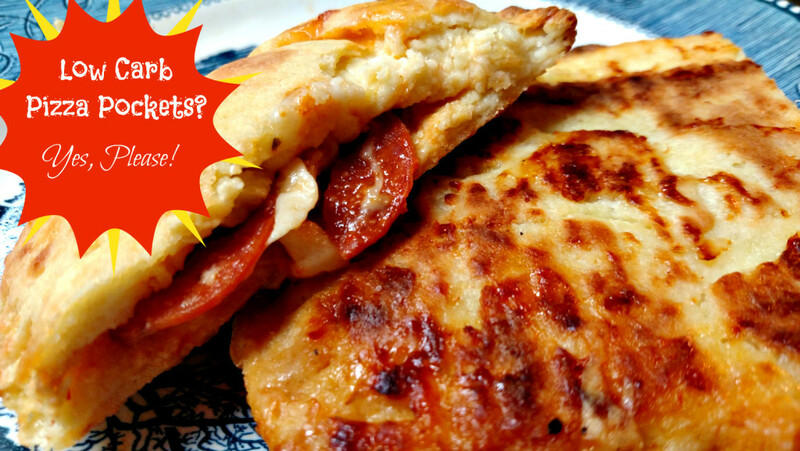 I used my homemade low carb pizza crust recipe to make low carb homemade pizza pockets. I admit I get jealous watching my son pop one of those store bought pockets out of the microwave. I really want instant food, too. But store bought convenience foods are unhealthy, wheat laden and full of carbs. But with a little work on the front end, you can enjoy easy “fast food” on the back end. So that’s why I wanted to rework my pizza crust recipe. 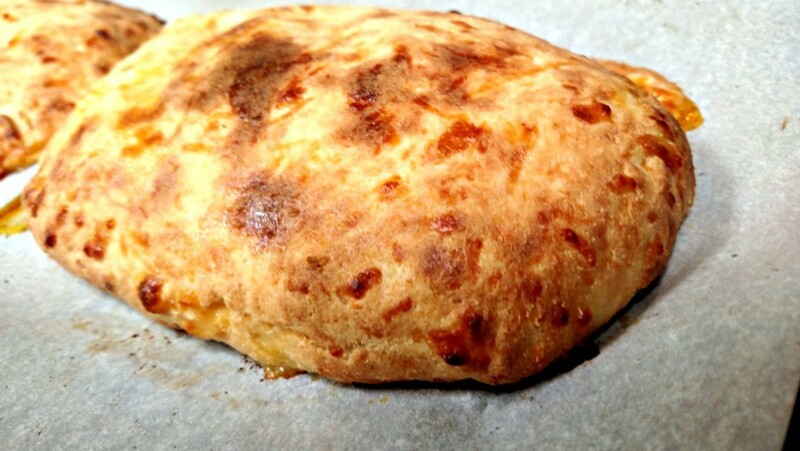 I doubled the recipe, rolled it out and sandwiched pizza sauce, toppings, and cheese in the middle and baked. I got four good sized low carb homemade pizza pockets. I ate one, and froze the others. Turns out this recipe freezes really well. Now when I am craving a quick pizza snack, I can take it out of the freezer, pop it in the microwave for a few minutes, and I can enjoy me some hot pizza pockets! Melt mozzarella cheese and cream cheese in the microwave in 30 second intervals, stirring each time. When you have a glob of gooey cheese, you’re good. Let cool slightly and add the remaining ingredients. Mix really well. The dough is really stiff, and I mix it with my hands to get it fully incorporated. Now let’s make us some pizza pockets! Line a baking sheet with parchment paper. 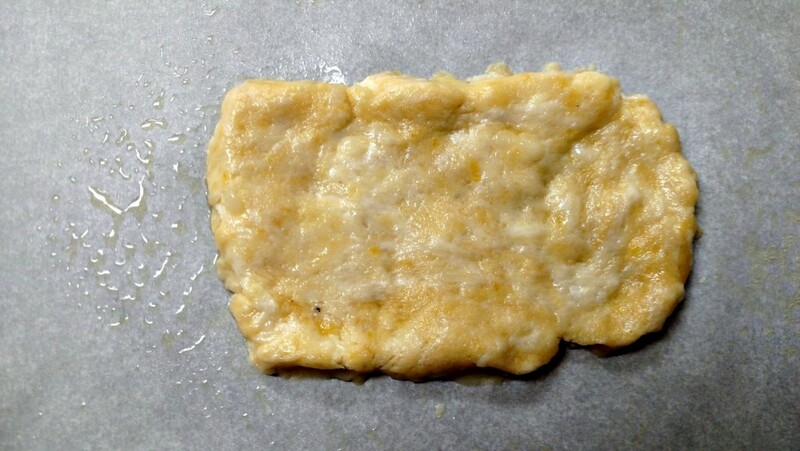 Pinch off a 3-4 inch ball of dough and, using your hands, press into a rectangular shape. Your crust should be about 1/4 inch thick. Make seven more rectangles. The dough will be soft, so be careful when you handle them. If the dough gets a hole in it, just press it back together, it is very forgiving. 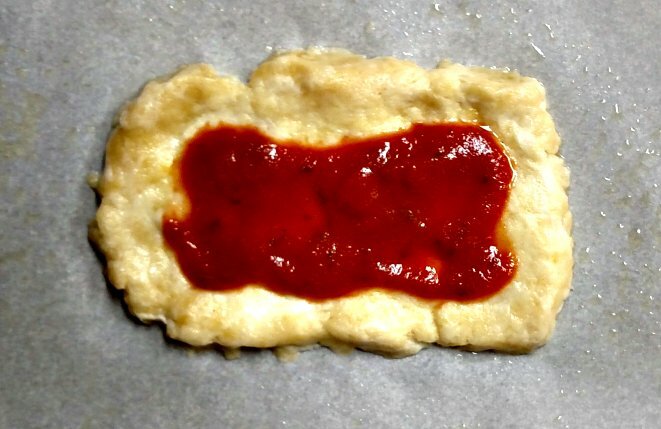 Spread pizza sauce to within a half inch of the edges. Next, add your toppings, such as cheese, pepperoni, mushrooms, etc. Keep toppings away from the edge, too, and don’t pile it too high so the dough won’t tear or be too short. Place the top crust over the bottom half of your pocket. 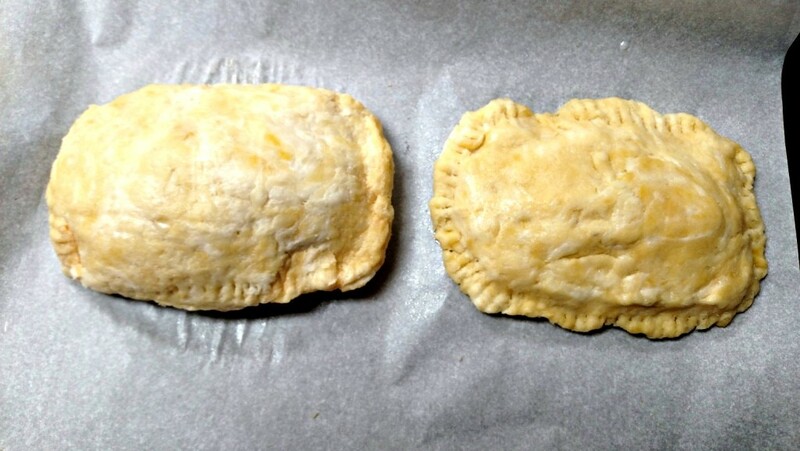 Using a fork or a pastry crimper, crimp the edges. Make sure to seal the dough ALL around. You don’t want any pizza goodness oozing out in the oven. Bake at 350 F for 25 minutes, or until golden brown. Let cool 10 minutes before serving. 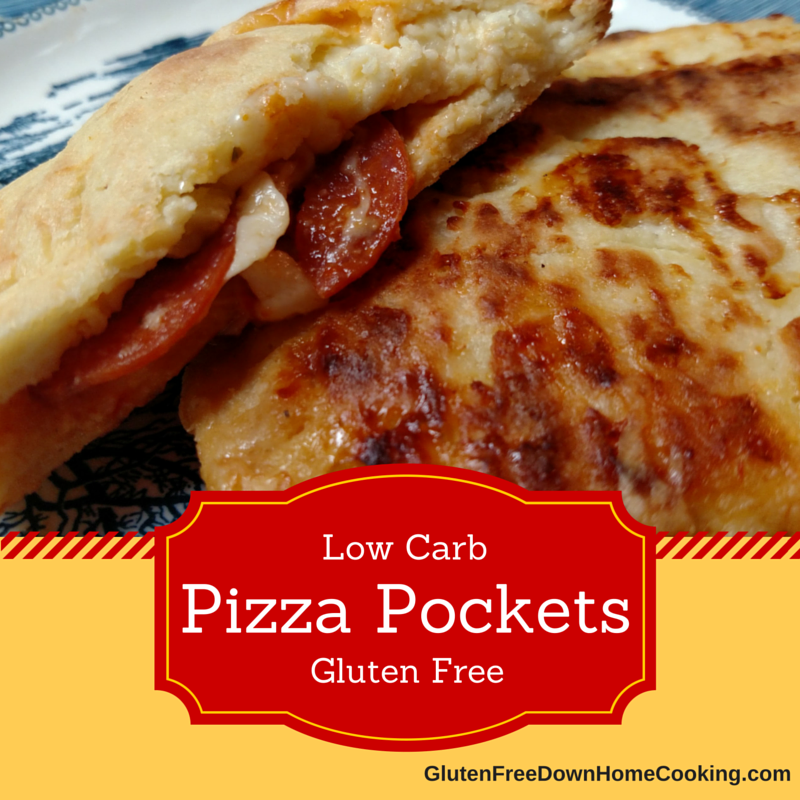 Enjoy your low carb homemade pizza pocket! Down Home Gluten Free is a participant in the Amazon Services LLC Associates Program, an affiliate advertising program designed to provide a means for sites to earn advertising fees by advertising and linking to amazon.com.